Barnes & Noble College speaks at the HCI Employee Engagement Conference to share their research, expertise and experience on today’s most significant workplace opportunities — Millennials. No matter the job market climate, companies are constantly searching for the kind of talented employees that can make a difference. Helping them with that mission is the Human Capital Institute (HCI), a global association for strategic talent management. By aggregating human capital best practices from prominent companies, thought leaders, and academic research, HCI supports employers by sharing new ways and better strategies to manage talent. In that vein, Pam Bonnell, Director of Talent Development for Barnes & Noble College, and Joan Kuhl, founder of Why Millennials Matter, were invited to speak at the recent HCI Employee Engagement Conference, to share their research, expertise and experience on one of today’s most significant workplace opportunities — Millennials. Presenting a segment Attracting, Engaging and Retaining Millennial Talent, Bonnell and Kuhl were among a distinguished list of guest speakers, including human resources and recruitment professionals from General Mills, Tesla Motors, LinkedIn and Ernst & Young. The importance of the Millennial generation in the employment pool was underscored by Barnes & Noble College’s Bonnell who explained that within five years, 50 percent of the workforce will be made up of Millennials – those born between 1980 and 1997. 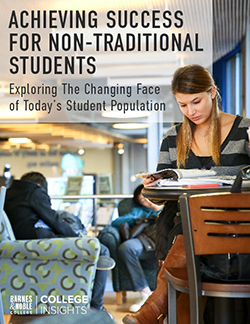 When it comes to understanding the preferences and potential of this group, Barnes & Noble College’s reputation as a Millennial employer of choice is strong. “As customers, we interact with 5 million Millennial students, and we employ 10,000 of them in our bookstores,” Bonnell explained in her opening remarks, “so we talk to Millennials as both our consumer and as our employee, every day.” She went on to explain that Barnes & Noble College integrates that understanding into not just the company’s learning and development programs, but also into the customer initiatives offered in the bookstore. 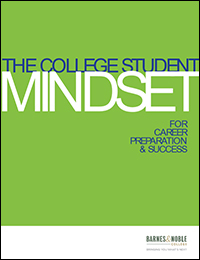 Much of this insight comes from the extensive research initiative Barnes & Noble College conducted last summer to discover what matters to this generation, and where their career expectations lie. Polling over 3,000 students, the research collected 17,000 open-ended responses and a goldmine of extensive feedback. “We discovered that they define success through personal fulfillment, by making a difference and giving back,” Kuhl revealed, stressing that the opportunity to make a contribution trumped the student’s desires for money, power or titles. However, despite those admirable management tendencies, she explained that some more fundamental skills are lacking. Strong communications abilities, project and time management skills, and being able to demonstrate initiative and good judgment were all qualities the respondents recognized as important to potential employers, yet didn’t feel they personally offered. “In many cases, they can ace the interview, but not excel and advance in that role,” Kuhl said. One reason for that lack of confidence might stem from students under-utilizing such work-related tools such as internship programs or even their campus’ own career center. To counter those weaknesses, yet provide employees with the tools and support to be successful, the Barnes & Noble College culture encourages ‘sharing the big picture’ and showing how the employee’s role contributes to the business and the future of the company. It also offers opportunities for development and ownership through highly successful initiatives like the Bestseller Management Development program. “Investing in emerging talent not only helps talent retention, but if they do leave, they’re going to be your best brand ambassador,” Kuhl points out. At Barnes & Noble College for example, Millennials choose to stay, and after two years, an overwhelming 70 percent decide to stay on and build their careers with the company. That’s in direct contrast to the general workplace, which reports 70 percent of Millennials choosing to leave their employer in less than two years.